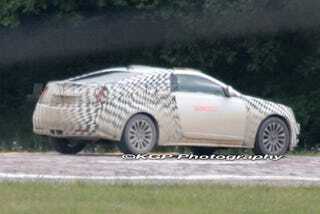 A Cadillac CTS Coupe without the usual clunky camo was scoped with a long-range lens through a misty Michigan morning by the eagle-eyed photographers at KGP. The photos show that in the transition from CTS coupe concept to reality the designers managed to maintain the large and shapely rear end, but with a few key differences. The tweaks include the addition of safety equipment like red reflectors and although the concept was pillarless, an obvious B-pillar. At least the designers have added a small piece of dark cheater glass, which we're starting to think of as the new requirement for any cut-down sedan-to-coupe platform from a US automaker. Fans of the concept should find these photos encouraging. Full spy report below. It took a long-range spotting scope to get it, but we just caught Cadillac's CTS coupe without its heavy camouflage covering. Now all that separates from the production styling of the CTS coupe is some checkerboard tape—and about a half-mile of distance between the camera and the prototype. The taped camouflage, long distance, and slightly foggy conditions all conspired to keep some of the CTS coupe's finer styling details obfuscated, but the overall design treatment is clearly revealed. In its uncovered state, the production CTS coupe still remains faithful to the original concept, but some minor changes are visible on the prototype's rear-end. The mesh vents which flank the central exhaust on the concept have been replaced with slim red reflectors, in a nod to safety standards on the production model. Also, the concept's license plate housing has been reshaped (perhaps to accommodate both U.S. and international registration plates), while a larger chrome strip adorns the trunk lid. The overall shape to the prototype's rear bumper looks nearly identical to the concept, right down to the careful sculpting at the bottom corners which wrap around toward the central exhaust. The side window lines look just about identical on both cars, while the truly B-pillar-free design on the concept is less exotic on the production car. Stylists appear to have done an admirable job keep a smooth glass-to-glass effect on the side windows, but a B-pillar is still in place. The front-end on this prototype looks to be straight off the CTS sedan, without the subtle body kit applied to the concept's front fascia.